I had my own Penny Lane moment this week when I got a random message from a friend in Brooklyn who asked me to help out some of her friends who were playing up in Burlington. I'd been toying of going to the show anyway (but not because I'm broke) and the promise of dinner and hanging out with the band was just icing on the cake. so I said YES, OF COURSE and spent the evening selling merch for Oberhofer and rocking out to both them and Matt and Kim. the boys were so so SO nice and I got to chill in the greenroom of the venue that I saw my very first real concert in (Rilo Kiley in 2005, in case you were wondering). 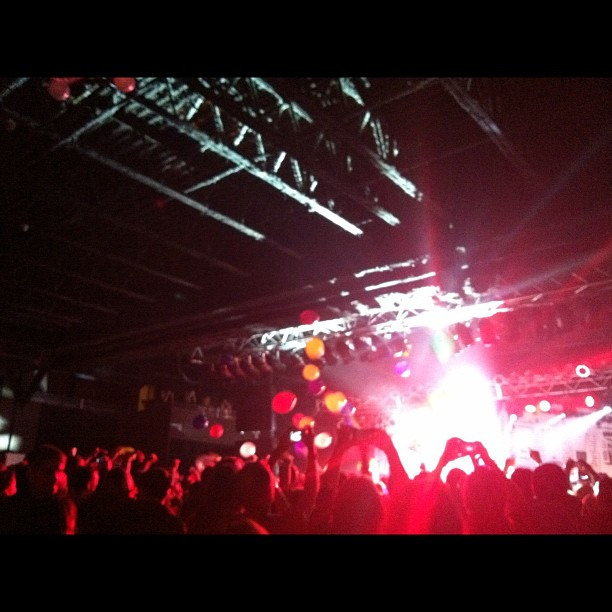 the boys put on a great show but were an interesting contrast to Matt and Kim. I'm sure you're familiar with that group as their synth and drums sound is played pretty heavily on MTV and the like (Daylight, anyone?). it was basically a crazy dance party and they proved that they know how to get the crowd going better than anyone I've ever seen. so if any other bands are looking for a groupie (or Band Aid, according to Penny Lane) in the Burlington area, or anywhere else, I'll totally travel, look me up.